a) complain about the delay with non-stop texts and tweets? b) go gallivanting on an airport exploration? I am definitely 'b'. Ever since I became a solo flyer, I act as if am some kind of aviation hub Shackleton who needs to discover all charted and uncharted nooks and crannies in every airport. Back in the day, layovers were drawn out and boring, entertainment for me was shoe shines and finding discarded New York Times (I'm looking at you CTL). Now, I find myself hanging out in the free tech hubs, chatting up pet owners in the animal recreation areas, enjoying some me time in the meditation zones and 10-minute manicure station, and even photographing the haze rise in those crazy glassed in smokers' areas. But this is old news, airports have gotten not just better, but have become award-winning destinations unto themselves. This brings me to Fiumicino, Rome's FCO, aka Leonardo da Vinci, and it's new Terminal 3. First and foremost, thanks to a history of baggage issues, strikes, and indefinitely "under construction" areas FCO never ranks near the top 100 hundred of the World's Best Airports, nor does it come remotely close Europe's Top Ten (and yes, Munich is that awesome). I'll admit I'm very partial to my hometown airport, probably because I always rumpled FCO tag on my bag and, yes, it's always my final destination. It's got a worn charm - the bad and the good, especially Terminal 1 and its bumper crop of shops- Gallo and Fabriano are excellent for last minute "Rome" gifts, good coffees spots and great pharmacy, and random souvenirs. It's always had a Look at Me, I'm Not Trying vibe that I find endearing because it's Roman through and through. 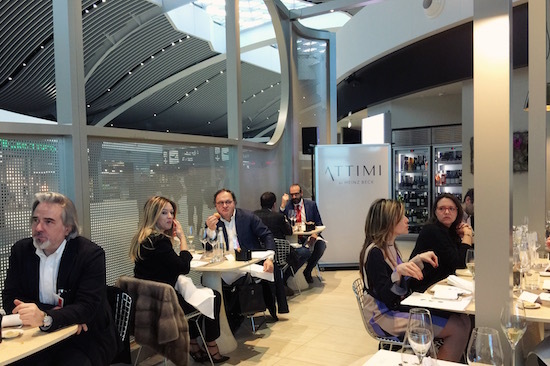 Nostalgia aside, FCO has long been in need of both a makeover and a reboot that makes passengers not just happy to have landed in Rome, but happy to hangout. As Italy's main airport and one of the busiest portal airport to cities throughout Europe and Mediterranean basin destinations, FCO has an incredible amount of of in transit traffic. And many of them are US passengers heading to destinations around the basin area, whose first and possibly only glimpse of Rome is FCO's Terminal 5. Now it's not just a great cappuccino that gives reason to enjoy the layover. Say hello to your next airport hangout, the newly-opened Terminal 3. Welcome to T3 Gate E, an uber-modern terminal for out-of-Schengen flights. Departing for London? In transit to Kiev, Cairo, Dubai? This is your domed-in 90,000 square foot playground. Bored? Walk around. Inspired by Rome's via dei Condotti and Piazza di Spagna, the ground level is a last-minute shopper's (or window-shopper's fantasy). 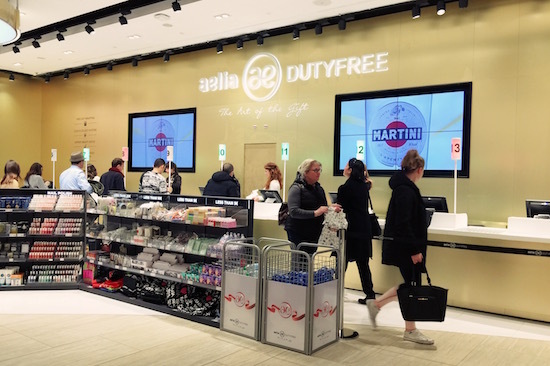 A 21st century duty-free Piazza di Spagna with Hermes, Versace, Fendi, Moncler, Bulgari, Gucci, Ferragamo, Dolce and Gabbana, and more, along with more affordable brands like Furla, Sunglass Hut, Unieuro and Benetton which means you’ll save the 22 percent VAT. And of course, there are the Duty-Free shops, an atrium center with the expected make up, liquor and cigarettes and a devoted Italian and Made-in-Italy section- treats like olive oils, liqueurs, candies and chocolate, as well as an easy (yes, very easy) Tax-Free counter with an Essie display in the check out line. I know, I know Essie has been in Rome for a while but never the color Chinchilly - found at T3! If shopping isn't your bag, there are lounges, finally, a lot of seats, free WiFi, and a series of classical music concerts organized by Rome's oratory Santa Cecilia. Hungry? The Upper Level is Food Court v 2, a stylized lounge and dining area hyping Italian delicacies at Bongustare and Chef markets , and three Italian menu restaurants and 2 caffes and Cristina Bowerman's eno-fab/Autogrill collab Assaggio Taste of Wine on the ground level. That's a lot right? For a change of taste, there's Beercode - a beer-centric, burger bar restaurant, and Ajisen Ramen, the Japanese insta-soup chain. 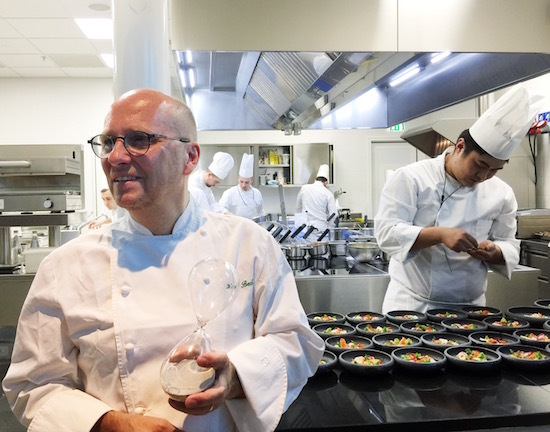 But most importantly, there is Attimi, Michelin star chef Heinz Beck's venture into "fast food". Attimi is clever, next gen and very Beckian, in particular his interpretations of sustainable haute cuisine, and in this case, transit. The menu is made of "moments" (attimi in Italian), smaller dishes that highlight Beck's elemental style and fusion background, and pay attention to the temporal concerns of the traveler. Fast food? Kind of. In addition to a la carte - for table and to go service, Attimi has three timed menus - 30, 45 and 60 minutes (yes, he is holding an hour glass in the photo). A gimmick? No, more like a call to arms to both himself and other Michelin chefs who are definitely longing for a new gastro-challenge to hit the tables. Travelers, remember all U.S. carriers serving FCO use T5 for check-in, and move to other terminals (including 3), as do the super-connectors such as Lufthansa. Once inside, passengers have the opportunity to travel within and around the FCO gates but it's always a good idea to check first both for timing and logistics. With the opening of T3, I'm hoping that FCO is also opening its eyes to user experience - in short, how quality, service and experience will keep us interested as we wait for our next flight. Futura. Verdana. Blackletter. Humans. Helvetica. Copperplate. Futura. Verdana. Blackletter. Humans. Helvetica. Copperplate. All I see in Berlin are letters. One ride on the U-Bahn turns into an afternoon of name-that-font on a timely transport of typeface. As I pass by each stop, I recite names of font I just saw. I am like letterpress Arya Stark. Futura. Verdana. Blackletter. Humans. Helvetica. Copperplate. There is something meditative about sitting in a yellow subway car, waiting for the doors to open to find an unexpected font long forgotten and preferably with umlauts and eszett. I do this for a few hours. I know, I know. You are thinking "Gutenberg, girl. Get it?" while I'm crossing my fingers, hoping that my metro card hasn't expired. There can't be more of this. But it keeps going. And there is no logic. San Serif, serif. All caps. Caps on first and the rest lower case. Black on white. White on black. Stencil on tile. Metal on marble. I run up for a breath of fresh air, some sun shine and a glimpse of the city. Berlin is bright and blue. Construction cranes are looming over most of the city in a slow motion ballet of building. Everything is neue. Dedicated to Brooks and Cary Ocon of Aardvark Letterpress, who will probably never read this. Want more Berlin U-Bahn type? So do I. Check out UrbanSketcher's lovely post and Kate Seabrook's Endbanhof photography series where she documented the entire U-bahn. I have a thing about letters, type and font. Vintage, die-cast lead signs make my heart swell. It's no wonder I have a huge crush on Louise Fili and only frequent bars with great signage [sadly, this bar just closed]. 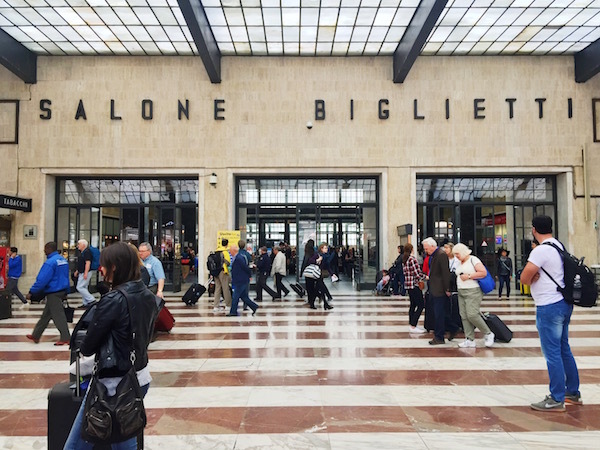 As long as there are gorgeous letters, I am happy-- so you can imagine why I was incredibly happy to have a one hour layover at Florence's central train station Stazione Santa Maria Novella. Santa Maria Novella is a cache of incredible 1920s and 1930s type from the standard lean Fascist lead font and neon exit sign to the gorgeous serif numbers that hide throughout the station. Bonus points for the striped orange/coral and cream marble floor. I woke up again this morning with a vague feeling that I had forgotten something. It happens every now and then, and I usually attribute it to pregnancy brain or just blame Los Angeles and my early 2000s style when rolling was just as much an accessory as stilettoes to the tank top and jeans uniform. The more I think about it, I wasn’t forgetting anything. No, I was feeling bits and pieces of a dream that was fuzzy and out of shape. 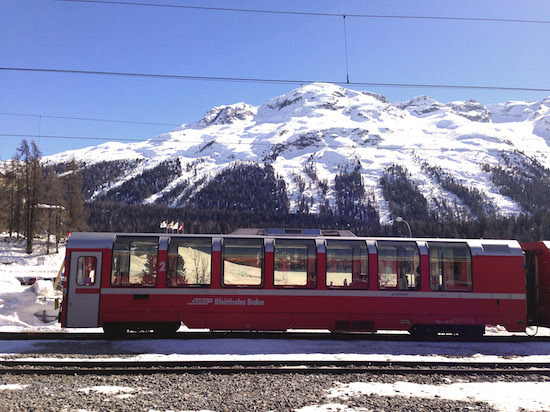 I push into my head and find myself on a train in the Swiss Alps and putting notebooks in a backpack. And quickly the dream comes back to me, I am on this train trying to get myself to do work (homework?) and reminding myself of all the other classes (vector algebra, medieval history, philosophy?) that I had signed up for but never completed. Somewhere I insist that I completed everything and would have never signed up for an upper level Algebra class. But my dream is relentless and pushes my into another subconscious where I am in a large test room, confronted by professors, admissions officers and guidance counselors who show me lists of work I still have yet to complete. 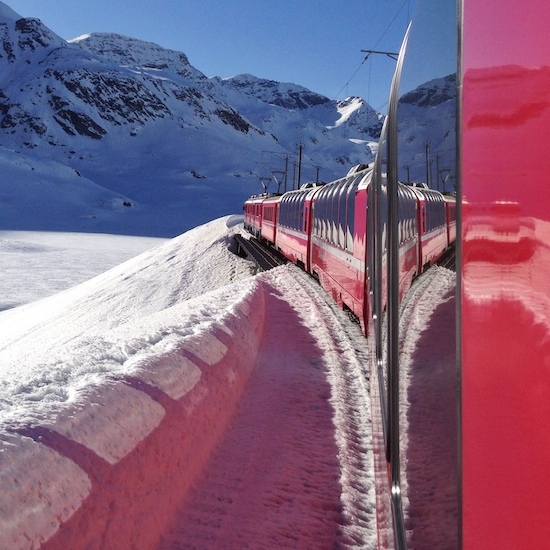 Dream interpreters will tell you that being on a moving train signifies personality growth, a movement toward better life. Add my re-occurring unfinished mystery dream, and perhaps I am moving toward better acknowledgement of the things I avoid, things I don’t want to do, places I don’t want to be. This article orginally appeared in the April edition of Discovery Magazine, the award-winning inflight magazine for Cathay Pacific. 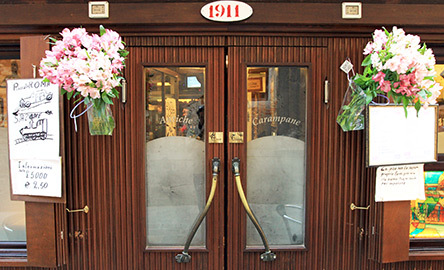 One of Venice’s most popular trattorias, Antiche Carampane is renowned for its delicious fish dishes. Possibly due to its small size, it has what can only be described as an intimate atmosphere. A kind of pied-a-terre for the gastronomically inclined, Carampane immediately feels like you are at home, or in someone else’s, with its exposed kitchen and owner Signora Librai at the service counter. 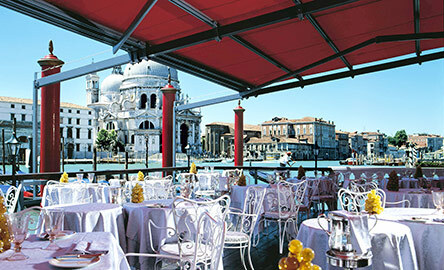 Its menu is exemplary Venetian cuisine, which is why you aren’t hearing English. 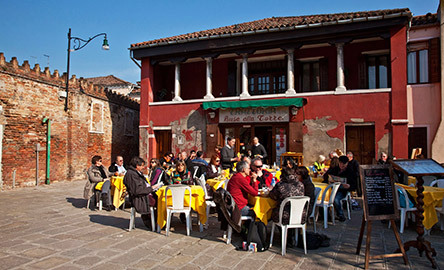 This Murano restaurant is perfect for an afternoon bite after spending all morning at the area’s glass studios. 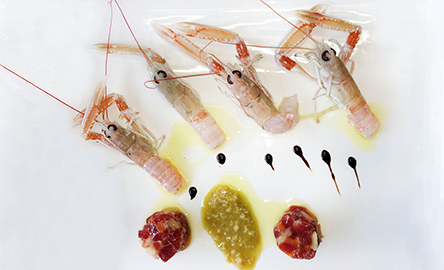 Serving simple fish-based dishes made from seasonal products from the Venetian lagoon, make sure to taste the fritte — fried delicacies such as moeche (lagoon crabs) and calamari e scampi (squid and shrimp). 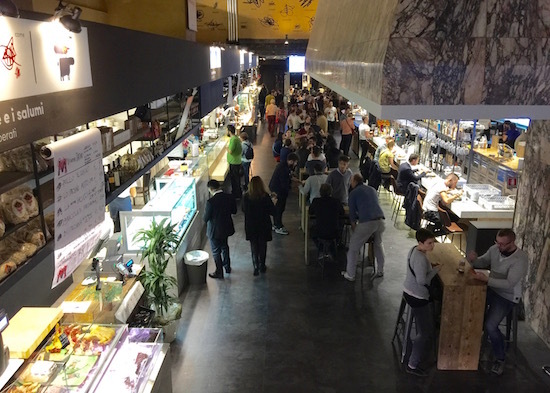 The owners of Al Cason, a renowned fish restaurant on the nearby mainland, have opened its wine bar/osteria counterpart in the San Toma neighbourhood. Quite possibly the hipster of Venice’s wine bars with its cool design and intimate setting, Del Cason is the perfect spot for a casually romantic night. 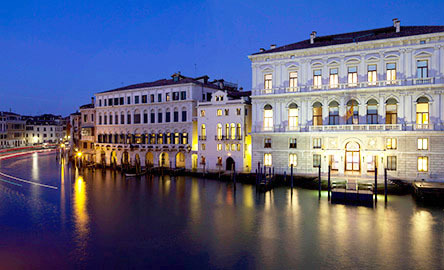 Keep your eyes on its ciccheti, especially the tris di bacalà — three different versions of the Venetian delicacy. Close to Piazza San Marco, the charming Il Ridotto is named in part for its tiny size (ridotto means reduced in Italian), and its ultra-modern vibe. 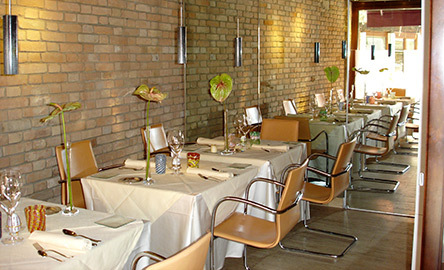 Exposed brick walls and modish Danish furniture provide a beautiful background for its innovative menu, which focuses on seafood along with game such as “lagoon hunting duck”. 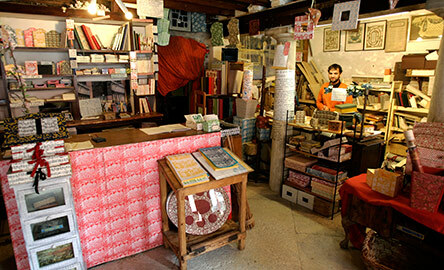 Considered Venice’s oldest paper shop, Piazzesi has been making beautiful, handcrafted marble paper and leather books since 1851. Inside the shop, you can return in time to the turn-of-the-century workroom — choc-a-bloc with paper, accessories and beautiful books, wood blocks, silkscreens and colours. At the beginning of the 21st century, the Palazzo Grassi became home to French entrepreneur François Pinault’s personal collection that has progressive contemporary art programming. Across the Grand Canal is Punta della Dogana, the old customs building, renovated by architect Tadao Ando, which showcases more works from Pinault’s collection. Once the private home of the Rezzonico family, the palazzo is now a museum dedicated to 18th-century Venice, with impressive Tiepolo frescoes, particularly in the charming Pulcinella room. 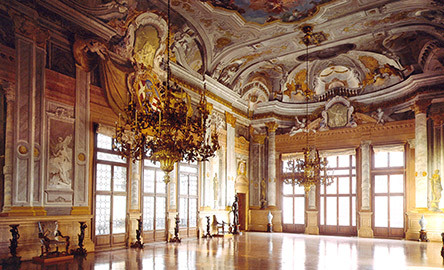 The Rezzonico chandelier was created specifically for the piano nobile and several are hanging throughout the palazzo. A family-run group with four fabulous hotels in Venice: il Palazzo, a 18th-century palace and its adjacent l’Hotel; Villa F on Giudecca island, a lavish 10-residence palazzo; and the Palladio Hotel & Spa in a Palladio-designed palace. Situated on the Grand Canal and around the corner from St. Mark’s Square, il Palazzo and L’Hotel have a prime location for exploring Venice and its surrounding islands. The hotels are decorated with vintage Seguso glasswork, including a magnificent ceiling creation at l’Hotel’s entrance, and Rezzonico chandeliers on every floor. There are two things in life that really make me smile: traveling via train and a clever pun. For my latest Huffington Post piece on the new kid on the rails, I had both.